For many children, their first encounter with toys and books comes at Diya Ghar, and they are bewitched. Driving around Bengaluru you’ll see construction sites mushrooming across the city spreading ever outward in a massive urban sprawl. Thousands of men and women toil at these sites catering to Bengaluru’s ever-growing need for new tech parks, malls, apartments and gated communities. Even as they work to satisfy the city’s insatiable need, however, the needs of their own children often get ignored. Playing amid heaps of sand and cement, dodging cement mixers and earth movers, many of these children have not seen, and may never see, the inside of a classroom. But one Bengaluru couple is determined to change that. Starting with their own neighbourhood of Ramamurthy Nagar, Saraswathy Padmanabhan and Shyamal Kumar have embarked on a project to cater to the early education needs of the children of construction workers across the city. It all started for Saraswathi and Shyamal when they returned to Bengaluru seven years ago after a brief stint in the US, feeling a pressing need to make a difference to the community they were living in. “When we lived in Sarjapur, my husband and I started visiting local settlements. We used to go every Saturday and give the kids biscuits and teach them songs and the alphabet. 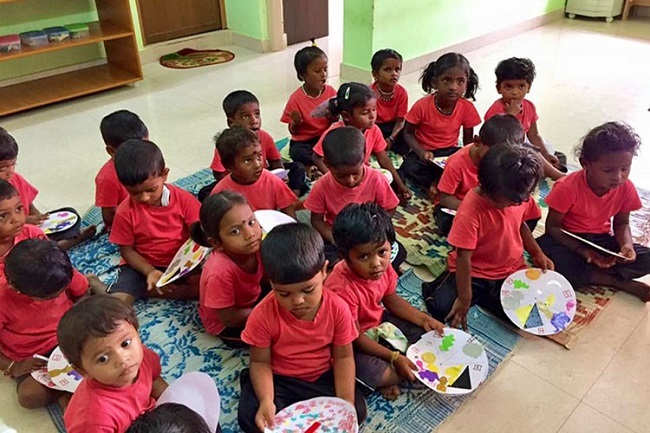 We did this for the few months we lived in that neighbourhood,” says Saraswathi, a trained counsellor, Montessori educator, and mother of three young children. When Saraswathi’s father’s property went up for sale last year, and they had some funds at hand, the couple finally took the plunge into turning those early efforts into a formal project. On July 1, 2016, the couple embarked on their dream project – Diya Ghar, a school exclusively for the children of construction workers in and around Ramamurthy Nagar. Starting out with five children last year, the school now has 30 children from the area enrolled with it. Saraswathi says that what prompted their efforts was seeing the neglect in which children of construction workers – most often migrants who escape policy nets designed for settled residents – grew up. Provided no proper housing, these migrant workers simply set up makeshift homes of blue tarpaulin tents in the nearest available empty plots with no real facilities to speak off. And while the parents toil, the children are often left unattended for many hours, with only older siblings to watch over toddlers and young children. “Due to neglect, these children often suffer from severe malnutrition, developmental delays and at times even fall prey to physical, emotional and sexual abuse,” observes Saraswathi. “While there are government schools in most areas, anganwadis or pre-schools are too few in number. From what I know, the existing anganwadis are also starved of resources, leaving thousands of children in the extremely crucial and vulnerable age-group of zero to six years unsupervised,” she adds. But starting off Diya Ghar wasn’t as simple as putting up a signboard and waiting for the students to walk in. In the first month after the school opened, Saraswathi says, she and Shyamal had to personally drive to construction sites in the neighbourhood, explain the concept of their school and the importance of early education to workers there, and win their trust. Their first breakthrough came with a group of families living on the Kalkure Main Road. “Though the concept of a school was very new to them, much to our surprise, the children took to the school almost immediately. They didn’t cry at all, and the parents were very trusting too,” says Saraswathi. Slowly, as word spread through word of mouth, other settlements in the neighbourhood offered to send their children to the school too. Diya Ghar functions according to the Montessori method, devised by Italian educationist Maria Montessori, which encourages exploratory play and learning in children with material that engages all their senses. 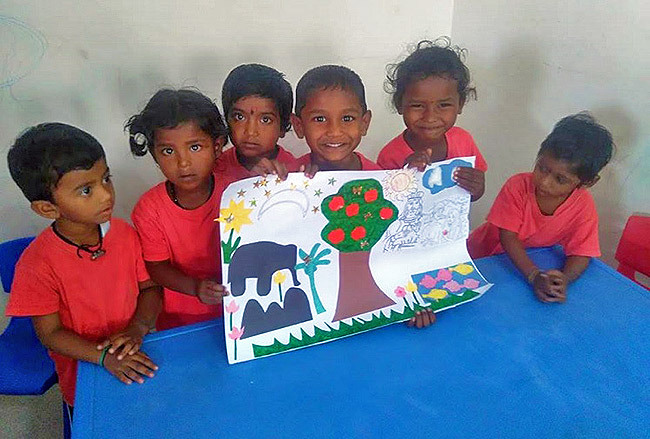 “As most of the materials are self-correcting in nature, they foster independence among the children too,” says Saraswathi. 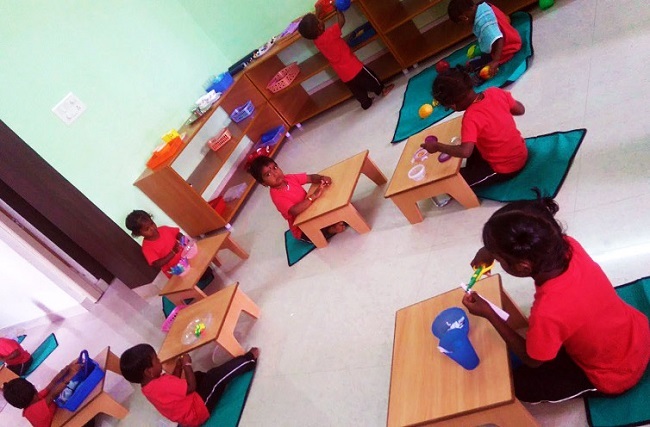 Montessori houses, as such schools are called, are typically mixed aged classrooms that have children between the ages of 2.5 to 6 interacting and working together. “It’s beautiful to see older children teach and help the younger kids,” Saraswathi smiles. For many of the children, who get their first exposure to toys and books at Diya Ghar, she adds, the experience is a bewitching one. There’s not a moment of boredom and the children experience every learning material with joy. A typical day in Diya Ghar starts at 8.30 am with Saraswathi driving around the neighbourhood and picking up the kids from the various settlements. “Every time I swerve into the road leading to a site and see the children waiting for me, their faces gleaming and clapping with joy, my day is made,” she says. The children are then brought to school, given a wash and changed into their school uniform, a red t-shirt and black pants. Since most of the children have nutritional deficiencies, home-cooked meals are provided for breakfast and lunch at the school, usually consisting of rice, vegetables, fruits and an egg. “Most of the children have never had vegetables, and are very apprehensive of them. We normally mix the vegetables with the rice, make a type of kitchdi and give it to them,” explains Saraswathi. The children work with Montessori material during the first half of the day and after lunch they nap and then engage in art and craft work. At 4.30 pm, after having their milk and snacks, they are dropped back home. Taking the example of three-year-old Megana – one of the earliest entrants to Diya Ghar, Saraswathi says the school’s enabling environment can make a major difference to children’s lives. “Initially, Megana’s parents were hesitant to send her to school as she was not toilet-trained and couldn’t communicate verbally. Megana also suffered from severe developmental delays; her fingers on her right hand were bent, her legs were weak and she would drool continuously,” recalls Saraswathi. Gradually, the couple managed to convince Megana’s parents that she would benefit greatly from attending their school. And within a few weeks of Megana joining Diya Ghar, her drooling reduced drastically. “Over the next few months, she started speaking a few words too. Eventfully she also learnt how to use her hands to do Montessori activities. Now her legs have become stronger and she doesn’t fall as often,” says Saraswathi proudly. The one thing that concerns Saraswathi and Shyamal deeply, however, is how to expand their efforts in order to make their interventions into children’s lives more meaningful and permanent. Diya Ghar currently runs on the goodwill of supportive residents in the locality, and interested individuals who volunteer to teach and help out at the centre. As more children from local communities come to the school, however, the personal savings of Saraswathi and Shyamal are turning out to be insufficient to keep it running. And enrolling children in education seems easy, explains Saraswathi, but retaining them in the system continues to be the bigger challenge. “The biggest challenge is educating construction workers on the importance of early childhood care and education. Over the last year about 25% of our children have relocated. We are exploring ways in which we can work with the parents so that they do not have to relocate frequently,” Saraswathi remarks. Assembling a like-minded team, a group of teachers who believe in, and are willing to commit to the cause, is also a concern, she says. “We are looking to network and form tie-ups with NGOs and government schools in other parts of the city and state. That way, when a child drops out from Diya Ghar because her family has to relocate, she can continue her studies wherever she moves to next,” says Saraswathi. Leaving aside the uncertain future, though, Saraswathi returns to the present to watch Megana work on a set of pink cubes – her favourite activity. As she puts the last cube in place, completing the arrangement from biggest to smallest, she calls out to Saraswathi and beams at her. And Saraswathi’s faith in her project is reaffirmed.